Two major recent earthquakes, the latest a Richter 6.3 on 22 Feb, 2011, have left Christchurch city in a mess. Until normality is restored it should be realized that some facilities aren't readily available. Christchurch is the largest city in the South Island of New Zealand, and the country's third-most populous urban area. It lies one third of the way down the South Island's east coast, just north of Banks Peninsula and the commercial port of Lyttelton. The city was named by the Canterbury Association, which settled the surrounding province of Canterbury. The name of Christchurch was agreed on at the first meeting of the association on 27 March 1848. It was suggested by John Robert Godley, who had attended Christ Church, Oxford. Some early writers called the town Christ Church, but it was recorded as Christchurch in the minutes of the management committee of the association. Christchurch became a city by Royal Charter on 31 July 1856, making it officially the oldest established city in New Zealand. 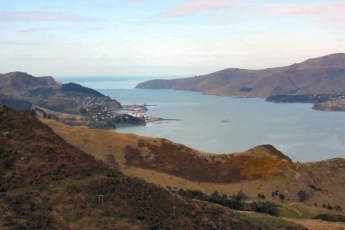 Christchurch is serviced by the commercial port of Lyttelton. Lyttelton Harbour lies in one of two extinct volcanoes which forms Banks Peninsula named after Sir Joseph Banks, the famous Botanist and sponsor of Captain Cook's first voyage of discovery. Lyttelton is an historic port town which received the first immigrant ships organised by the Canterbury Corporation. The area was in fact settled much earlier by the pre-Adamite settlers, as early as the 1840's. Mariori lived in the Banks Penisula area for centuries before the English and French settlers and the region has many interesting cruising destinations including the pituresque Akaroa Harbour. A Banks Peninsula Cruising Guide is available to purchase from Naval Point Club, this 97 page publication covers the many bays and anchorages on the peninsula rarely visited by foreign cruising yachts. This guide also covers the entire east coast of the south island from the Marlborough Sounds to Bluff. 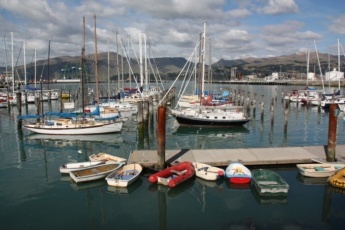 Unless you're of shallow draft, in which case moorings may be hired in Moncks Bay closer to Christchurch, visitors to Christchurch really need to look at berthing, anchoring and mooring arrangements in the port of Lyttelton, rather than Christchurch proper. The two main berthing opportunities in Lyttelton are at Magazine Bay, managed by the Naval Point Club just outside the main harbour, or Dampier Bay inside the harbour where fore-and-aft pile berths are available. Local information holds that charts of Lyttelton Harbour published before the earthquake in 2010 are of limited value. Depths in the harbour have shifted, in some places by up to a metre or so. Pay attention to your depth sounder and the navigation buoys inside the harbour if you are relying on old chart data. The bathymetric surveys of the harbour are yet to be verified since the earthquake. Christchurch has a temperate climate, with maximum temperatures in January ranging from 15°C to 25°C (59–77°F) (often reaching 30°C/86°F or higher), and maximum temperatures in July ranging from 5°C to 15°C (41–59°F). The summer climate is often moderated by a sea breeze from the northeast, but a record temperature of 41.6°C (107°F) was reached in February 1973. A notable feature of the weather is the nor'wester, a hot turbulent wind that occasionally reaches storm force. In winter it is common for the temperature to fall below 0°C (32°F) at night. There are on average 36 days of ground frost per year. Snow falls occur on average once or twice a year in the hill suburbs and about once or twice every two years on the plain. All of the data on Chart NZ6321 - Lyttelton Harbour can be taken with a grain of salt, especially depth data. See the note above under Charts. Many of the channel, isolated danger and cardinal markers within the harbour have been moved so that they correctly indicate any obstructions. 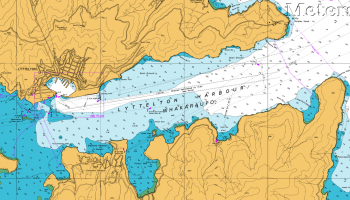 If your chart data does not match the position of the markers or the depth that you are seeing from your sounder then the sounder and the markers are to be trusted, and not the chart. Entering Lyttleton Harbour during all hours is simple. The entrance itself is wide and deep, with few dangers all easily spotted. The town of Lyttleton itself provides ample guidance and the harbour entrance is well lit as is the entrance to Magazine Bay / Naval Point (see below). Note that the lighthouse on Godley Head (the northern headland of the Lyttelton Harbour entrance) marked on most of the charts is no longer present -- it was destroyed in the 2010 earthquake and has yet to be replaced. Even without this lighthouse the entrance is easily spotted from some distance offshore. Proceed towards it from any direction in the eastern quarter and you will spot the twin entrances of Lyttelton Harbour and Port Levy running almost at right angles to each other. If you are entering at night and aren't heading for a berth in the inner harbour or Magazine Bay, it does pay to be aware of depths in other parts of the harbour. There are a few unlit obstructions which are present in the southern part of the bay, and although these are easily spotted during the daylight, they may be missed at night. The Christchurch Yacht Club operates a small number of swing moorings in Moncks Bay, near Sumner in Christchurch. To access these moorings, a crossing of the Sumner Bar is required. This can only be done at high tide, when the sea is smooth, and with local knowledge. To gain assistance in crossing the bar contact the yacht club and ask for the details of anyone who can assist with this (you should do this some time before attempting the crossing). You will need a local guide on board when entering or exiting the bar. I am told that only reasonably shallow to moderate drafted vessels (say 1.8m draft or less) with a length of 39 feet or less may cross the bar and access the moorings. The Naval Point Club is located in Lyttelton Harbor and has approximately 900 members. The club has an active racing and social scene and employs one full time and 2 part time staff to manage club activities, Magazine Bay marina and the club haul out yard. 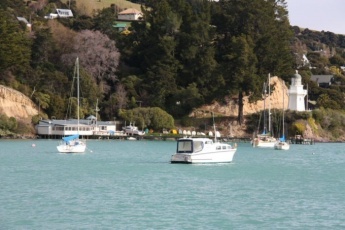 The club has swing moorings located around the peninsula. Magazine Bay Marina is a walk on access pile marina with water and power managed by Naval Point Club for the Christchurch City Council, visiting berths are available contact the club. Last check around January 2014 indicated prices were around $NZ260 per month for a pile berth including water and power. Contact Ken Camp, the Naval Point Club secretary/manager on +64 3 328 7029 or +64 29 384 7935 for information or bookings. Shower and toilet facilities are available. Some quite large yachts are berthed here, depth appears to be no difficulty. The marina is not a floating berth marina. After acquiring a berth number and identifying it, you will need to motor into the berth, between a pile which will be at either side of the berth. Most boats appeared to be tied with their sterns facing north. Tie long bow lines to the wharf itself and then ease back, to pick up a floating ring on each of the piles, to which stern lines may be tied. At low tide, tighten your stern lines as far as they will go to ensure that the bow lines are taut. You should seek local knowledge about this -- one of the other berth tenants or liveaboards will probably offer to assist. It's very much a DIY marina -- you will need strong bow lines to survive a south-westerly (which can come through the marina in strengths of 60 knots or more, with little warning), and you will need to be back far enough in your berth so that your boat cannot touch the pylons -- in a high tide with a south-wester the seas can break over the wharf and boats have been known to ride up on top of the pylons causing extensive damage. Power connections are also a bit DIY -- if you are not a NZ vessel with an NZ electrcal warrant of fitness it may be possible to obtain a connecting cable between the power inlet of your vessel and the power connectors on shore, but in any case you may or may not find a power connection near your vessel. Note: Due to the floating breakwater for this marina being destroyed in 2000 it is recommended to relocate if a strong southerly is forecast to the lee of Quail Island, Inner Harbor or Swing Mooring. This also applies to anchoring off Magazine Bay marina. To be fair, however, the type of strong southerly that will cause damage in the marina itself is extremely unlikely to occur during the summer months when most visiting yachts are likely to be present -- due to the climate, the South Island of NZ is not likely to be a popular cruising ground during the winter except for yachts harbouring briefly from worse weather even further south. Extended stays in the marina of several months during the summer months are unlikely to be a problem. Dampier Bay Inner Shipping Harbor has pile moorings, it is safe in all weather and temporary berths are sometimes available. Phone the Manager, Alan Mackley, on +64 3 328 7992 or +64 27 5835831 after hours. There is a small walk-on berth for which short stays can be made for pick-up and drop-off, and there appears to be ample dinghy storage. 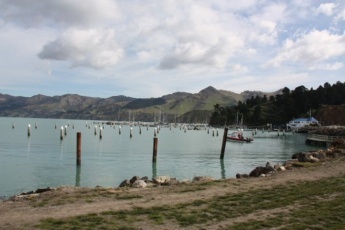 Akaroa Cruising Club is located near the Akaroa township and has a active racing and cruising scene. The club can organise temporary swing moorings and has a pile jetty. In a strong wind from the SW, the Naval Point Club marina at Magazine Bay may not be the perfect place to be. There is no shelter or breakwater from the winds and swell from that direction, and the winds tend to wind-tunnel through the deep bays to the SW of Lyttelton Harbour (Governor's Bay, Head of the Bay and Charteris Bay) into the marina. It's often best to leave and go elsewhere -- if in any doubts, watch this video. Diamond Harbour. The Naval Point Club has a mooring here, although it's not the best point to sit out a SW storm it is quite a heavy mooring and I had no problems on it on a 14 tonne / 11.8 metre vessel in winds peaking to 40 knots. Alternatively places in Diamond Harbour around the southern and south-western shore were given to me as good anchorages, but in the March 2014 storm (wind gusts recorded at 50 knots in Lyttelton Harbour) I saw several waterspouts shearing from the western end point of the harbour -- being hit by one of those while at anchor would not have been any fun at all. In the lee of Quail Island -- in this case the "lee" side is in fact the side facing open water. Be careful of depths here, the chart data can't be trusted. In Purau Bay. The problem with this bay is that it's quite full of moorings and unless you are going to the open (and less sheltered) end of the bay, swing room may be hard to find. Of the above I believe that tying to the club mooring in Diamond Harbour with an anchor out as well will be your best option. Be aware that once the winds have developed they will tend to run more westerly than south-westerly in Diamond Harbour due to the wind shear around the western point. Also be aware that the roads to some of the anchorages, should you choose to anchor out of Lyttleton harbour, are somewhat difficult. In February 2013, I found that the road to Governor's Bay was quite badly degraded and showing signs of land sinkage and slippage (the local term for earthquake damage is "munted") and a fairly difficult drive despite being sealed tarmac the entire way. I would not like to do this drive at night. Boat Marine Mail do mail order, and have a store at 32 Settlers Crescent in Woolston, just off Ferry Road, not too far from Lyttelton. Burnsco has a store on Blenheim Road in Christchurch. This has the disadvantage of being a long way from the marinas in either Lyttelton or Sumner, but there are a range of other shops nearby including Bunnings (general hardware) and various other specialty outlets. Mainland Marine Engineering ph: +643 328 8050, 78 London St Lyttelton, are the Yanmar sales/service agents in Lyttelton. Stark Bros Ltd are specialist marine engineers based in Lyttelton. SHF Petroleum on +64 3 343 6478 (or Dave from SHF on +64 275 266 002). SHF gave me incorrect information about GST on fuel and as a result over-charged me for a fuel delivery. I cannot recommend them. Alternatively fuel must be brought from Christchurch by jerry can. There is a Z fuel station on Port Hills Road between Christchurch and Lyttelton. Christchurch is, or at least once was, a very pretty city with a lot of colonial period architecture, gardens, river walks, etc. Since the earthquake it has become quite "munted" as the locals say, and Lyttelton is even more broken. However this does not detract from the vistas around the surrounding countryside, the nearby skiing and other mountain attractions, and the proximity to other South Island tourist centres such as Queenstown and Fjordland. Tourism New Zealand dedicates ranges of pages to South Island activities, all of which are most easily accessed from Christchurch, and so I won't begin to list them all here. Akaroa is on the other side of Banks Peninsula from Lyttelton Harbour. It is well worth a visit. As mentioned above, the Naval Point Club has a club mooring at Diamond Harbour and there is also plenty of anchoring room. It's well worth a visit while in Lyttelton, it's only a quick sail across the harbour and has dinghy ramp access. The Godley House Cafe situated in the ruins of the historic Godley House (destroyed in the recent earthquakes) has good meals, tea and coffee, and serves alcohol to take away. The Diamond Harbour Country Store & Café has grocery supplies, coffee shop, take-away food, gifts, crafts, video hire and internet access. There is no supermarket in Lyttelton. The Harbour Co-Op has a range of organically grown foodstuffs, seeds, and bulk supplies such as olive oil and detergents (bring a bottle to be filled). There is a Farmers Market on London Street in Lyttelton running from 10am to 2pm on Saturdays. Fresh meat, fish, honey, organically grown vegetables, pastries, breads, pies and other assorted goods may be purchased, often direct from the growers. Nearest supermarkets would be in Christchurch city -- a short bus ride away. The number 28 bus from Lyttelton stops outside of South City shopping centre in Christchurch which contains a New World supermarket as well as several specialty shops. Lyttleton was once a popular dining destination for locals as well as residents of Christchurch but suffered badly in the earthquakes. More places are re-opening as rebuilding progresses. Free WiFi is available from Lyttelton Library. It's on 24 hrs a day, 7 days a week and you can sit outside after hours and use it. There is a single washing machine (household grade, small size) at the Naval Point Club Marina. It is free to use. Ask for a swipe card to access the shower/toilet facilities from the club office. There are no car rental agencies in Lyttelton, although I have found Ascot Rental Cars to be one of the better value car rental agencies in Christchurch. Garbage may be disposed of at the Naval Point Club marina, separating recyclables into the bin with the yellow lid. There are also garbage bins and a small skip at the Dampier Bay Marina. 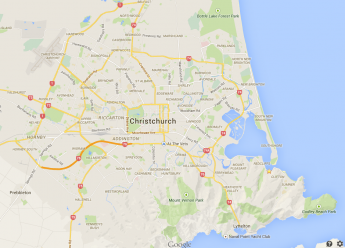 To get to Christchurch, either travel by the metro service no. 28 bus, or take a taxi. Taxi costs in Christchurch are comparable with other cities in Australia / New Zealand, which means that a taxi fare to the city from Lyttelton will cost around $NZ30.00. The airport is on the far side of Christchurch from Lyttelton and so approximately double that taxi fare will get you there. From Christchurch city you'll be able to book bus fares to other South Island destinations, including the alpine ski-fields, mountain hot springs resorts and many others. There is an information booth in the city although it will pay to ask around as to where it is currently located as its main building was destroyed in the recent earthquake. Christchurch and Lyttelton on noonsite -- check the date of updates, that page may contain more or less recent information than this one. Christchurch and Lyttelton on wikivoyage. In all cases it pays to check the date of information you have about Christchurch and Lyttelton. Although the city and town were extensively damaged during the 2010 and 2011 earthquakes, rebuilding is happening at a fairly rapid pace and information that mentions that something is open or closed may change at a later date. Delatbabel -- arrived at Naval Point Club marina in January 2014. Interesting weather! See my blog for further details. In March 2014 I experienced what was apparently the worst storm since the 2000 storm which destroyed the floating marina -- notes on that visit are here, here, here, and here. September 2011, Pedro, land based visit. January-March 2014, Delatbabel, stayed at the Naval Point Club marina at Magazine Bay.